The former presidential press secretary and Rhode Island native fills us in on what it was really like behind the scenes at the White House and the one thing he'd do differently. Sean Spicer is used to being in the hot seat. He did it for six months in the White House as press secretary for President Donald Trump. His love for politics was born long ago in Barrington, where he grew up. What started as helping local campaigns turned into a career that landed him on the national stage — and not all in a good way. The forty-seven year old took heat from day one on the job when he greatly exaggerated the size of the crowds for Trump’s inauguration. He later regretted that. 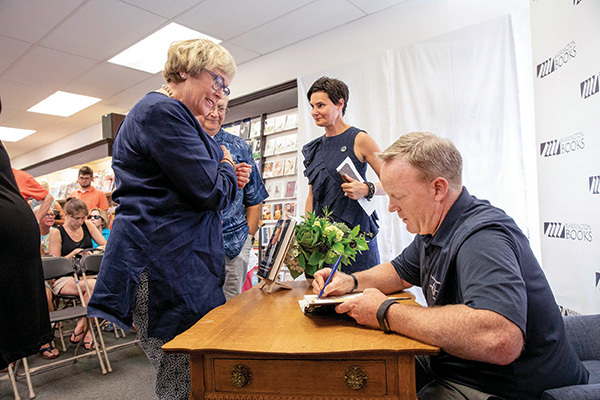 He came back to Rhode Island as part of his national book tour for The Briefing, which is when we caught up with him to talk politics, his homecoming and his number-one do-over. RIM: Let’s start with the book; I know you’ve been busy with it. What’s been the reaction and how do you feel about the reaction so far? RIM: Are you surprised by any of the negative response, whether it’s been from some individuals or that signing that was canceled [at BJ’s Wholesale Club in Seekonk, Mass.]? Did that surprise you? Sean Spicer: Not entirely. A little, but not entirely. There’s a lot of people, there’s a difference between people who don’t like me and criticism of the book. So clearly if you’re protesting before the book is released then it’s not really about the book. I’ve had to get that through my head. As far as the signing being canceled in Seekonk, it’s disappointing that they allow people on the left to shut out the exchange of ideas in a conversation. RIM: So, what’s one thing you want people to get out of this book? Sean Spicer: I think just a greater understanding of me from the events surrounding the last two years. RIM: Do you think you’re misunderstood because of “Saturday Night Live” or something else? Sean Spicer: I think it’s not just a question of misunderstanding. A good percentage of the population, the only thing they know about me is things you saw during the briefing or a parody you saw on a show. RIM: Looking back on your time, what do you think the biggest misconception is of what happens behind the scenes at the White House? Sean Spicer: I think the biggest overarching thing is probably people’s misconception about the motivations. A lot of times, people will say, “You intentionally went out and said this.” Did we make mistakes? Sure. Did I screw up every once and a while? Yes. But was it intentional? No. I just think we had a very large stage. For most people who have previously worked in the White House, you could do a lot of this without the same level of intensity and scrutiny. RIM: Do you ever talk with the president since you’ve left? Sean Spicer: Yeah. I talked to him two weeks ago. RIM: What do you guys talk about? Sean Spicer: He called me to talk and just catch up: “What have you been up to? I haven’t seen you in a couple of weeks.” Sometimes it’s about specific issues. I’ve kept him up to date on the book. There’s no agenda and that’s the beauty of it. We can just catch up. RIM: What has the president said about it (the book)? Sean Spicer: So far, he’s tweeted out that he loved it. RIM: In the book, do you get into the Mueller investigation? Sean Spicer: No, not really. I mean, I talk about it tangentially. There’s not really much that I can get into. The answer is no; how’s that? I touch on it, but I don’t dwell on it. RIM: What’s your take on the investigation right now? Sean Spicer: I think there’s two things at stake. One is collusion; I have yet to see anything underlying the allegations that people have made. The second is meddling. To me, it’s sort of a hodgepodge. You clearly have these Russians who’ve been indicted for meddling in our election and I think that’s something that we knew a long time ago. So, I think that where there’s evidence of meddling, we should root that out. And then seek to prevent this from happening again. RIM: Have they [special counsel investigators] been in touch with you? Sean Spicer: I don’t discuss that. RIM: Knowing what you know now, it didn’t work out with (Anthony) Scaramucci and then Sarah Sanders was brought in. Do you ever wish you had stuck it out more or do you think that wasn’t possible? Sean Spicer: It wasn’t possible. I found the sweet spot. Here’s the thing: Could I have stayed? Yes. But my time was up. The question was just when. I don’t see any scenario where it would’ve turned out well. RIM: Is there much you would’ve approached differently about the job in hindsight? RIM: What’s the number one thing you wish you could have a “do over” on? Sean Spicer: The number one thing unequivocally is that first day. I think it set the tone and tenor for everything that was to come. I don’t think I appreciated how transformational a period we were going to go through and how disruptive Donald Trump was going to be as a president. RIM: So, what’s next for you? 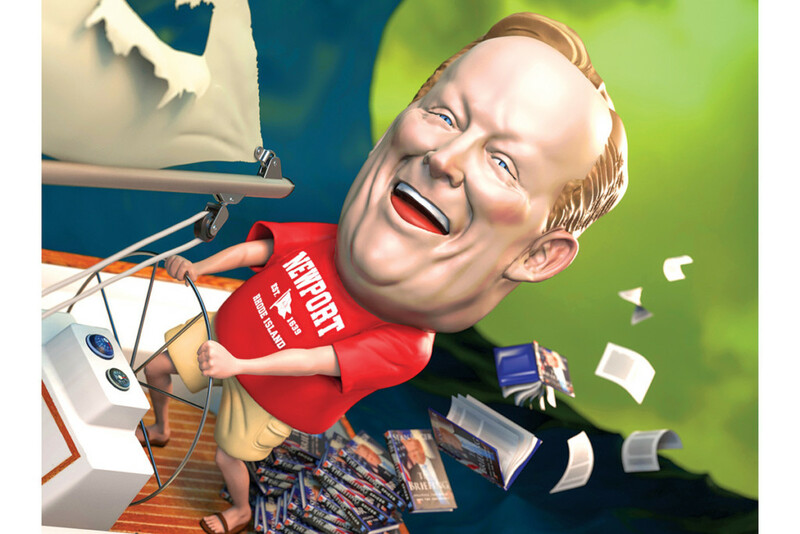 Sean Spicer: I’m going to be on the book tour for the next couple of months. I’ve launched a podcast. I’ve got a consulting firm that I’ve launched that’s advising clients’ strategies. I’ve got some entertainment projects that have been in the mix and then I’ve been heavily on the speaking circuit. RIM: You’re back in Rhode Island a lot more now since being done with the job at the White House. What are some of the things that you’re doing? RIM: You obviously still have family here in Rhode Island. What does your mom think about your fame or the responses you get from people? Sean Spicer: I don’t know if I’ve ever asked her that. RIM: Does she roll her eyes or think you can do no harm? Sean Spicer: She can be an objective critic. But she and my wife are tied for first place when it comes to supporting me. RIM: Is your mom or others in your family Trump supporters? Sean Spicer: We don’t talk a ton of politics. They are supporters of me as I am of them. They obviously know where I am and where I vote. I think it’s a mixed bag a little bit. I honestly, for a lot of reasons, don’t push in the same way that you do with friends. We just try not to get into who voted for whom. I think it keeps a little bit of levity in the family. My dad and I talked a little more about politics back in the day. RIM: Do you have any plans to move back here to Rhode Island or are you going to stay in D.C.? Sean Spicer: I don’t have any plans to move back here permanently. It’s where my extended family is. My brother lives in New York, my sister’s in Boston so it’s a great place for the entire family to gather. RIM: If you had to do this ride all over again, would you take that job in the White House as press secretary? lot that I have learned. This interview was completed on July 27, 2018, in Rhode Island.